Roman Reigns recently spoke with The Daily Express in the UK and talked about issues he faced before his WWE days, and how cousin The Rock inspired him. "Probably 15 years of my life playing college football on a scholarship, I was having a daughter at the time. 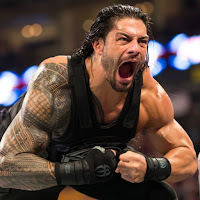 I had no money, I had no job, I had very little direction but I had a very huge purpose at that point and that was to take care and provide for my family which has grown ever since," Reigns said. "I'm not going to go too deep into my backstory and the struggles and the adversity I had, but essentially I was ousted from football for a medical situation. It wasn't because I wasn't good enough. It just didn't work out for me. It wasn't supposed to be for me. I think like a lot of different people throughout this world I ran into a bunch of different similarities as far as adversity and stuff like that." "I think The Rock has inspired me just like everybody. I'm not a hater, I like to see people do good. People want to see others do good, but not that good. And he's a great example, someone who continues to shatter the ceiling. It doesn't matter the obstacle or what kind of situation that he's put in and he seems to come out on top every different avenue that he drives in so kudos to him in just being the hero and inspiration that he is. "Sports entertainers can do a little bit of everything. I think he's done that for his fans all over the world and he continues to do that." Reigns also spoke with The Daily Express about what he thinks would turn him heel - a feud with Daniel Bryan. "Y'all want to see me turn heel, put me in the ring with Daniel Bryan. It's just about reactions. We can talk about so many different things about wrestling and the things that make the art form and performance," Reigns said. "But when it comes down to it, it's just about making people make a lot of noise. And there's no question when Bryan gets out there, sometimes it will go one way or the other - YES or NO with him. But the way he's able to affect and control the crowd is very cool and to go and share the ring with someone like that, and obviously the reactions and the way I stir up the crowd, I think it would make for a pretty dynamic and electric atmosphere." "Bryan is one of the best ever to step in the ring. I have a lot of respect for him. To see someone like him who's on top and to have it all taken away so fast is very scary. It's very cool to see him back and to have his talents back on the roster and back in that ring helping and contributing to the business that we both love. I think it would be pretty neat to be able to be in the ring with him," Reigns added.